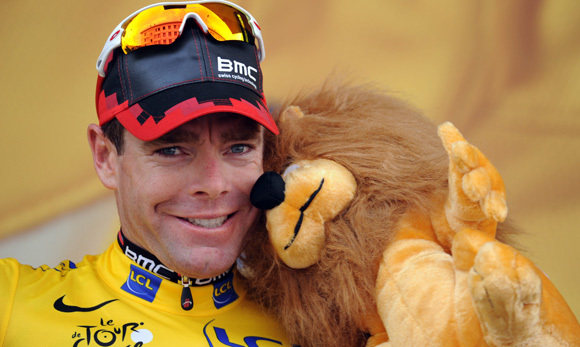 Cadel Evans knew the clock would not lie. His likely superiority over the Schlecks in the time trial shaped his tactics in the Alps. In Grenoble he delivered. It may be an old cliché but the time trial is indeed the race of truth. We, the spectators, demand the riders attack one another in the mountains for our entertainment. Like Roman emperors we give the thumbs up to those who please us, and bay for the blood of those who disappoint. But in the end, a Tour de France that comes down to a race against the clock is a deeply pragmatic event. A time trial can expose the weakness of the riders in a way that even a mountain with a gradient of ten per cent cannot. It’s just each man for himself and the clock, which never, ever misleads let alone lies. There’s no tactics involved, no flair required, just an innate sense of judgement. So when the general classification virtuel caption showed that Cadel Evans was just 21 seconds behind Andy Schleck at the first checkpoint we knew it was all over. Evans proved what everyone already knew, that he was the superior time trialist. It was that fact which shaped his tactics throughout the race. As long as he was within a minute of Andy Schleck, he knew he was in the driving seat. Andy Schleck has improved at time trialling over the past 18 months but really he’s only nudged the dial up from ‘dire’ to ‘reasonable’, as far as credible overall contenders are concerned anyway. Yet there remained the possibility that the yellow jersey would do for him what it had done for Thomas Voeckler, enabling him to summon up additional reserves of courage and determination. Unfortunately for Andy Schleck, it did not have that effect. He looked vulnerable from the start, as if the considerable exertion of two aggressive days in the Alps had caught up with him overnight. Evans, on the other hand, flew. Four years ago, he came up short in the final time trial against Alberto Contador, losing the Tour by 23 seconds. In 2008, he was expected to push Carlos Sastre closer, even if a gap of a minute and 34 seconds looked too much to close. Evans, who had been struggling with injury throughout the critical phase of the Tour, could only take half a minute back. This time, he would not be denied. In fact, he was just seven seconds slower than Tony Martin, who had been able to conserve a bit of energy in the Alps and had earmarked this stage ever since he won on the same course at the Critérium du Dauphiné in June. And so Evans will become the first Australian to win the Tour de France when it concludes on the Champs-Élysées on Sunday. Looking back over the past three weeks, it is easy to say with the benefit of hindsight what an assured, carefully plotted victory it has been. Evans has barely been out of position throughout the race. Look at his positions in the most important stages. He won at Mûr de Bretagne and has been in the top six on every day that has mattered. Overall, he has never slipped lower than fourth (after the stage to Serre Chevalier). The most worrying moment came on Friday, when he was in difficulty early on the first climb and stopped, believing his rear brake was rubbing. Nor has it been a wheelsucker’s victory. He has pressed and probed when he’s needed to – admittedly not with the same flair and turn of speed that Contador or the Schlecks have shown at times. He has taken responsibility and measured his effort supremely, not least on the Galibier when Andy Schleck was up the road and no one else wanted to help chase. Tony Martin was not a surprise winner of the 42.5-kilometre time trial around Grenoble. Last month he won on the same course during the Dauphiné. That morning Cycle Sport saw him riding the key sections several times, despite the heavy rain. Clearly he also had the Tour in mind. Fabian Cancellara was the first potential winner to tackle the course and, as one of the early starters, he rode in the worst of the day’s weather. His time of 57 minutes and 15 seconds was distinctly average by his standards but heavy rain made the descent treacherous. For those tackling it in the dry, it was extremely fast. In the wet it was a different matter. Cancellara’s time was beaten by Saxo Bank’s Richie Porte, who went 12 seconds faster. Then Thomas De Gendt, the surprise package of the day, came home in 57-02 as the roads continued to dry. Martin blew that away, finishing in 55-33 – just five seconds slower than at the Dauphiné, this time after three weeks of hard racing. No one was going to get close to that, surely. Except Evans did get close. He was only seven seconds down on Martin at the finish. The Schlecks have the consolation of knowing they will make the podium together. Andy Schleck becomes the first rider to be runner-up three years in a row. He may even find himself a Tour winner without even getting on a bike next month if the Court of Arbitration for Sport rules against Alberto Contador and strips him of his 2010 title. Contador, who was third in the time trial, lifted himself from sixth to fifth overall but was some way off toppling Thomas Voeckler, the Frenchman who led the race for 10 days and was able to defend his fourth place. There was further shuffling of the minor places as Samuel Sanchez went from seventh to sixth at the expense of Damiano Cunego. Jean-Christophe Peraud hauled himself into the top 10, with Europcar’s Pierre Rolland, winner at Alpe d’Huez slipping to 11th although he kept his white jersey ahead of Rein Taaramae.